For the past little while, I have been going through all the stuff in the study. Twenty-three years living in this house, what has accumulated is overwhelming. I keep stopping to get sentimental, especially about items from our sons’ childhoods. They might not be all that interested in keeping mementos (I looked it up, there is no need for an ‘e’ before the ‘s’ ) but as a mom, I feel duty-bound to hold history in a box. Something turned up the other day, having fallen between the couch and the cedar chest. There were cat hairs and mold and a muddy color of something not recognizable on the whiteness of the fabric. I pre-treated, washed, soaked, then washed again. Some stains are meant to stay. 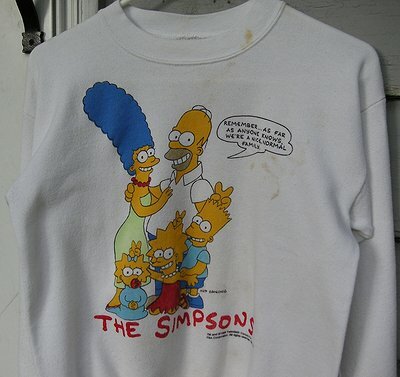 This is a sweatshirt with a picture of The Simpsons, in a size to be worn by an 8 year old child. The picture copyright says 1990. Homer is saying “Remember, as far as anyone knows, we’re a nice, normal family”. We thought it was a great shirt because we love the cartoon, and because we live in the Town of Normal. I sent an e-mail to Lucas (because I seem to remember him being the one who wore this shirt the most) but he says there is no need to keep it. Now, at least, I have a picture. Then I came across a box of papers. Chris says there is no reason to save a Thank You note from 1990, even if the person is no longer living. 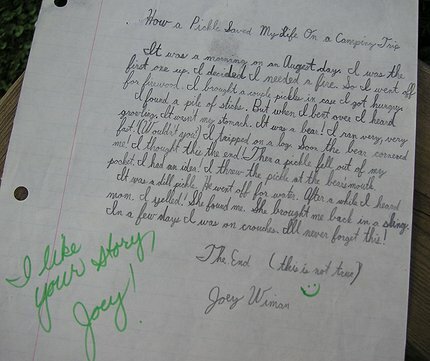 Her handwriting can cause my heart to skip a beat, tho. About halfway down, this picture surfaced. The green border is a pickle. 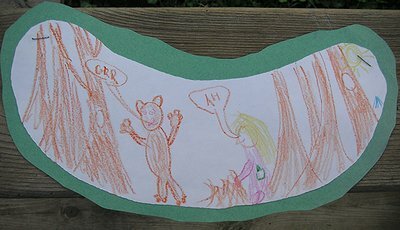 The picture is a bear in the woods, and a kid with a pickle in his pocket. See the green speck? The paper pickle is the illustration for the story below. I believe oldest son, Joe was in 4th, maybe 5th? grade when he wrote it. I made a photocopy and sent it to his Grandad, who took it to his Book Study group. There, the praise for the story was unanimous. Reproduced with exact spelling, and punctuation. It was a morning on an Augest day. I was the first one up. I decided I needed a fire. So I went off for firewood. I brought a couple pickles in case I got hungry. I found a pile of sticks. But when I bent over I hear a growling. It wasn’t my stomach. It was a bear! I ran very, very fast! (Wouldn’t you?) I tripped on a log. Soon the bear cornered me! I thought this was the end! Then a pickle fell out of my pocket. I had an idea! I threw the pickle at the bear’s mouth. It was a dill pickle. He went off for water. After a while I heard mom. I yelled! She found me. She brought me back in a sling. In a few days I was on crouches. Ill never forget this! If I keep finding little gems like this, nothing will be moved out to make room for the exercise equipment. My husband just wants it all gone, time to move on and reclaim the space. Sigh. I’ll see what I can do. 7 Responses to Sweet History—-Must. Let. Go. Now. It is a difficult thing to do away creations of you youngsters. In a file cabinet in the basement I still have a few items like Joey’s and I know my kids either don’t want them or have no room to keep them. But I still hang on to them! That is so cute. I love the drawing. Oh man! You just can’t get rid of stuff like that. It’s fun to look at things that you have not seen in awhile. I go thru my closets and files and find stuff that i had forgotten that i had. I already have a big plastic crate down in the basement of stuff I’m sure Katherine will not be interested when she’s older. And I still feel guilty when I throw away the smallest drawing she’s done. So I have touched a common chord with other folks. You all seem to know my dilemma, and are so sweet with your comments. The shirt will be going to a guy we know who owns a comic book shop. His oldest daughter is just about the size to be wearing it, at least to play in. I have some wonderful letters from my sons to their Grandparents that came back for my safe keeping when the Grandparents passed on. I treasure them, but I am not sure my son John will. I guess some are not as sentimental as I would like them to be. Perhaps, if he had children it would make a difference. I learned a long time ago to take a photo of something I want to treasure and have to get rid of to make space for todays things. It does work well.